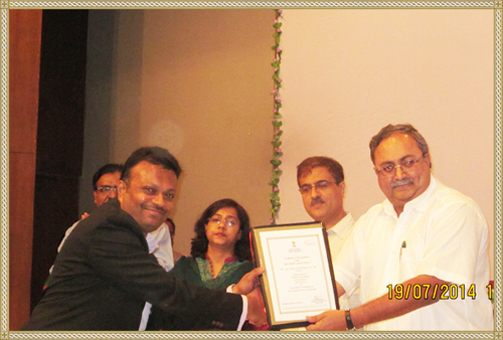 2002 JANUARY : INSTALLED 1ST PRODUCTION LINE WITH CAPACITY OF 300MT PER ANNUM AND STARTED COMMERCIAL PRODUCTION OF TONER. 2004 JUNE: ACQUIRED ADDITIONAL LAND FOR EXPANSION. 2009 SEPETEMBER: INSTALLED 3rd PRODUCTION LINE WITH CAPACITY OF 300MT per annum , MAKING TOTAL INSTALLED CAPACITY @ 900MT per annum. 2010 INITIATED BUSINESS IN NEWER GEOGRAPHIES IN SOUTH EAST ASIA & WEST ASIA. 2011 AUGUST : PURCHASED NEW LAND -KASHIPURA SITE FOR EXPANSION. 2012 JUNE: INSTALLED 4TH PRODUCTION LINE WITH CAPACITY OF 300MT per annum, MAKING TOTAL INSTALLED CAPACITY @ 1200MT per annum. 2014 APRIL: INSTALLED 5TH LINE AT THE KASHIPUR SITE WITH CAPACITY TO PRODUCE 300MT Per annum, MAKING TOTAL INSTALLED CAPACITY @ 1500MT per annum. 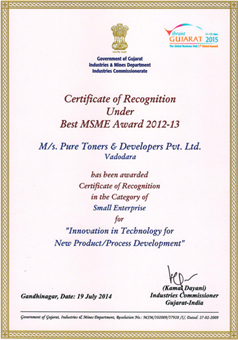 AWARDED BY GOVERNMENT OF GUJARAT FOR ENTREPRENEURIAL EXCELLENCE OF BEST MSME in the catagory " INNOVATION IN TECHNOLOGY PROCESS DEVELOPMENT"